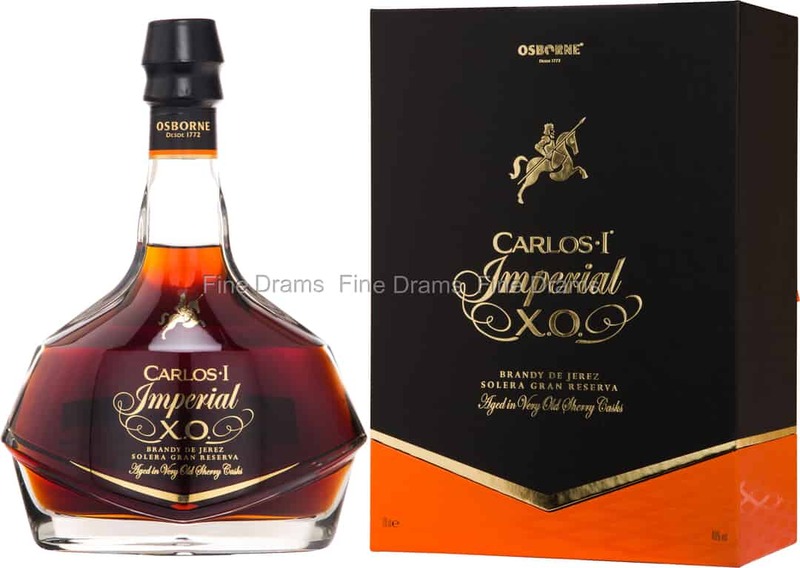 The flagship premium bottling in the Carlos I range of Spanish Brandy de Jerez. Jerez is, of course, more famous for its fortified wines, and like a sherry, this Brandy has been aged in Solera system. In this system, each time a cask is tapped for bottling, it is topped up with spirit from the next oldest cask, in turn topped by up the next oldest. This ensures a good consistency and balance of flavours. The Brandy has been aged in former Amontillado and Oloroso sherry casks, with some of the spirit over 20 years old. It is also distilled from the wines used to make sherry. The result is a brandy deeply flavoured with notes of sweet wine, red berries, dried fruits, old oak, wine tannins, spice, mocha, plums, grapes, and caramelised apples. Rich, decadent and sweet, this is the perfect after dinner drink. Beautifully presented in an angular decanter style bottling with a smart presentation box.